2014 Workshop on Big Data and Urban Informatics – Jeremy S. Wu, Ph.D.
After more than a year of preparation, the Workshop on Big Data and Urban Informatics was held at the University of Illinois at Chicago on August 11-12, 2014. More than 150 persons from at least 10 countries (Australia, Canada, China, Greece, Israel, Italy, Japan, Portugal, United Kingdom, and the U.S.) attended the forum sponsored by the National Science Foundation. Piyushimita (Vonu) Thakuriah, co-chair for the workshop, reported on the funding of Urban Big Data Center at the University of Glasgow in Scotland (http://bit.ly/1kXG2Uh). Its mission is to “support research for improved understanding of urban challenges and to provide data, technology and services to manage, make policy, and innovate in cities.” The Urban Big Data Center partners with five other universities including the University of Illinois at Chicago. Vonu, a transportation expert, is the director of the center. In the course of two full days, 68 excellent presentations were made in total, far exceeding the expectations of the organizers a year ago. These papers will be posted in the web in the near future. Two luncheon keynote speakers highlighted the workshop. Carlo Ratti presented the state-of-the-art work of the MIT SENSEable City Lab, which specializes in the deployment of sensors and hand-held electronics to study the environment. Since conventional measures of air quality tend to be collected at stationary locations, they do not always represent the exposure of a mobile individual. In one project titled “One Country, Two Lungs” (http://bit.ly/1nbSBXi), a team of human probes travelled between Shenzhen and Hong Kong to detect urban air pollution. 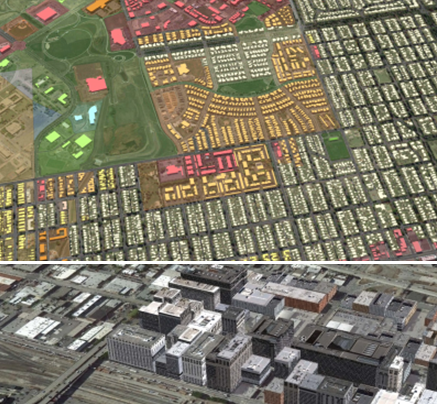 The video revealed the divisions in atmospheric quality and individual exposure between these two cities. Paul Waddell of the University of California at Berkeley presented his work on urban simulation and dynamic 3-D visualization of land use and transportation. Some of his impressive work images can be found at http://bit.ly/1rn9hmj. His video and examples reminded me about their potential applicability for creating the “Three Districts and Four Lines” in China’s National Urbanization Plan. I also learned about a somewhat similar set of products from China’s supermap.com, a Geographic Information System software company based in Beijing. One of the 68 presentations described the use of smart card data to study the commuting patterns and volume in Beijing subways during rush hours. One other presentation compared the characteristics of big data and statistics and raised the question of whether big data is a supplement or a substitute to statistics. The issue of data quality was seldom volunteered in the sessions, but questions about it came up frequently. Through editing, filtering, cleaning, scrubbing, imputing, curating, re-structuring, and many other terms, it was clear that some presenters spent an enormous amount of their time and efforts to just get the data ready for very basic use. Perhaps data quality is considered secondary in exploratory work. However, there are good quality big data and bad quality big data. When other options are available, spending too much time and effort on bad quality big data seems unwise because it does not project a practical, future purpose. There were also few presentations that discussed the importance of data structure, whether it is already built in as design or created through metadata. Structured data contain far more potential information content than unstructured ones and tend to be more efficient and optimal in information extraction, especially if they have the capability to be linked across multiple sources. For the purpose of governance, I was somewhat surprised that use of administrative records has not yet caught on in this workshop. Accessibility and confidentiality appeared to be barriers. It would seem helpful for future workshops to include city administrators and public officials to help bridge the gap between research and practical needs for day-to-day operations. Nations and cities share a common goal in urban planning and urban informatics – improve the quality of city life and service delivery to constituents and businesses alike. On the other hand, there are drastic differences in their current standing and approach. China is experiencing the largest human migration in history. It has established goals and direction for urban development, but has little reliable, quantitative research or experience to support and execute its plans. The West is transitioning from its century-old urban living to a future that is filled with exciting creativity and energy, but does not seem to have as clear a vision or direction. Confidentiality is an issue that contrasts sharply between China and the West. The Chinese plans show strong commitment to collect and merge linkable individual records extensively. If implemented successfully, it will generate unprecedented amount of detailed information that can also be abused and misused. The same approach would likely face much scrutiny and opposition in the West, which has to consider less reliable but more costly alternatives in order to meet the same needs. There is perhaps no absolute right or wrong approach to these issues. The workshop and the international community being created offer a valuable opportunity to observe, discuss, and make comparisons in many globally common topics.